Subject to various other terms & Stipulations, Assessee can save amount of Long Term Capital Gain (LTCG) arising from transfer of plot by investing the amount of net sale consideration for Purchase of another house property. If all the expenses as mention above are forming the integral part of the purchase price, exemption could be claim u/s 54F. However, if the expenditure (like POP, Solar heater etc) is incur additionally as a luxury measure subsequently (after the house is habitable), then the additional amount may not be consider for the purpose of claiming an exemption. Sir, if a person has kept Rs. 30/- Lacs in a bank as fixed deposit and if he raised the demand loan/overdraft for purchase of a plot or flat, whether he can claim exemptions available in IT Laws while repaying the installments and interest? I presume but please confirm that it will be termed as a loan taken from the bank irrespective of the fact whether the loan is from own deposits or otherwise, and he can very well claim repayment of installments & interest and ask for tax exemption? Kindly clarify and oblige. Deduction is admissible u/s 24(b) for the interest on amount borrowed for purchase/ construction of the house property. For claiming the deduction, assessee has to get a certificate from the lender about the interest pay for purchase/construction of the house property. The deduction is admissible in respect of repayment of loan taken for purchase or construction of the house property. If I sale my flat and stay in my daughter’s flat as tenant what tax implication will be on the sale value of the flat? If a flat is bought with the help of my daughter and I sale my present flat after 2-3 years how the sale value will be tax? Can my daughter take loan from bank/financial institution to buy a flat in my name? If my daughter buys a flat in her name through bank loan and I pay her EMI through accrue interest of fix deposit of the sale value of my present flat as tenant, how tax will be fix on me/her? If the entire sale value is transfer to her account since she bought the flat (though in her own name) for my stay, will she be tax? On sale of flat, the resultant Long Term Capital Gain (LTCG) would be taxable in your hands. If you sale the existing flat within a period of one year after buying the new flat and if the investment in the new house property is more than the amount of LTCG than the entire amount of LTCG could be claim as exempt u/s 54 of the Income Tax Act-1961. If however, you sale the existing flat after a period of one year from the date of buying new flat, then the exemption would not be available against the amount of LTCG and the amount of LTCG would be taxable. Normally, Bank can sanction the loan of flat by taking your daughter as a co-applicant in the loan documentations. It appears that you are incorporating her name in the loan documents for availing the housing loan only. If it is so, then in such case, incorporating her name in the loan document won’t carry any tax implications. 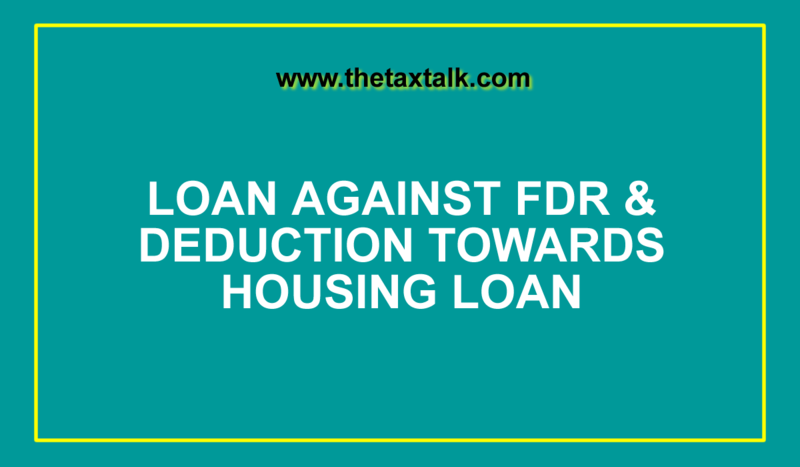 If you sale the flat and invest the sale consideration in Bank FDR, the resultant interest income would be taxable in your hands. The payment of EMI by you in your Daughter’s loan A/c could either be consider as Loan or Gift to your Daughter, as per your intention. In either case, the amount would not be taxable as her income. If you gift the entire amount to your daughter for purchase of flat, there will not be any tax on the amount of gift in the hands of your daughter. But, it appears that your daughter is already owner of one house property and the new property will be the 2nd house property in her name. The second house property carries a different tax treatment as compared to first house property. The detail discussion on the topic has been cover in my Tax Talk Date 29.10.2012. The same can further be retrieve from ehitavada.com or from www.nareshjakhotia.blogspot.com.